Cheers to a Gorgeous Life! : Rafa is Back! I am hooked on tennis again after watching the recently concluded French Open on LIVE TV. (I managed not to mind at all that the commentary was in Arabic.) It was sweet revenge for dear Rafa, who won all sets during the finals against the one who holds the reputation of being the only player who stunned him at Roland Garros. Like all of his fans out there, I jumped on the couch, rejoiced at the proof that his wobbly knees are healed and he seemed emotionally recovered from his parents’ divorce – well at least emotionally okay enough to concentrate on his tennis. Rafa is back in the game! It is his fifth French Open title, and he also won the 3 clay tournaments on the way to Roland Garros. There is surely no mistaking now that he is indeed Bjorn Borg’s successor – the King of Clay of this generation. 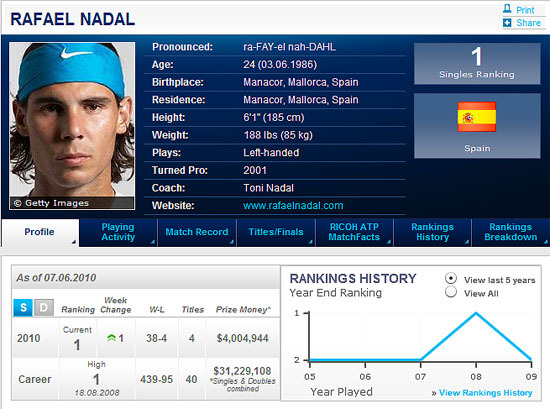 Due to his French Open win Rafa has returned to No. 1 in the ATP rankings, overtaking Federer. This is like 2008 all over again. Thus, I am looking forward to another epic Nadal vs. Federer finals this upcoming Wimbledon tournament. Rafa starred in Shakira’s Gypsy video. Perhaps getting the exclusive show of Shakira’s gyrating moves is actually the thing responsible for his good luck this year?